This 9.5-mile loop features quite a bit of climbing (2,000 feet), but the views of surrounding peaks and of the Columbia River Gorge make it well worth the effort. All Seasons with proper gear. The Hamilton Mountain Trailhead is located on the Washington side of the Columbia River Gorge, literally across the street from the ever-popular Beacon Rock. This beautiful 9.5 mile loop, with 2000 feet in elevation gain, explores a good sampling of what makes Pacific northwest gorge hiking so epic: great vistas, powerful waterfalls, lush wildflowers, and to top it all off, a great workout. One of the Gorge's many hikeable peaks, Hamilton's basalt cliffs are a great place for geology buffs to get a close up look at how the Missoula Floods helped carve out this area roughly 15,000 years ago. You’ll also travel through two distinctly different forests; the first comprised mainly of large Douglas firs and the second of alders. The trail also visits a pair of waterfalls before leading into the rather stunning meadows, complete with cliff-edge views of Table Mountain, Mt. Hood, Mt. Adams, and the Bonneville Dam. The hike begins with a moderate climb until you get to Hardy Falls, Pool of the Winds, and Rodney Falls, all easily accessed via side trails, all within a few hundred feet of each other. After viewing those, you will cross a footbridge and continue on the main trail past the Hardy Creek Trail, a junction you approach after about .2 miles. You will soon hit steep switchbacks leading to cliff-edged ridges that reward you with amazing views of the gorge. You will cross the main ridgeline of Hamilton Mountain and continue climbing until you reach a junction. The trail to the right will dead end into the summit, where the view is impeded by shrubbery. For the best view, take the trail to the left, going downhill slightly and that is where you will see the incredible views of the surrounding Cascade Mountains and the Columbia River Gorge. From here, it is suggested that you go down the way you came, as the loop back can be a little bit confusing. There is much to see along the trail when you hike Hamilton Mountain. The first waterfall you will come to is called Hardy Falls, which you can see via a marked side trail on the right. The second is just a few hundred yards away on a side trail to the left, which is called the Pool of the Winds, which is a rock-formed pool created by pouring water from Rodney Falls. The water cascades through a slide that has formed through the force of the water and is quite a magnificent sight. If you do this hike on a clear day, you will see Mount Hood, Adams, Saint Helens, and Table Mountain from the plateau described above. For food and drink consider visiting the Hearth in Washougal. This wood-oven bistro produces a wide array of plates well beyond pizza. And as an added bonus, there is a full service bar. Because of its steep nature, this is a challenging hike, but not impossible for even less experienced hikers. The challenge is far-outweighed by the amazing views along the way and at the end of both the gorge and the surrounding cascades. For experienced hikers, this is good training for bigger mountains and is still challenging with an incredibly rewarding view at the top. To get to the trailhead from Portland, take I-84 east and exit at Cascade Locks. Take the Bridge of the Gods into Washington, which requires a $1 toll and take a left on WA 14. 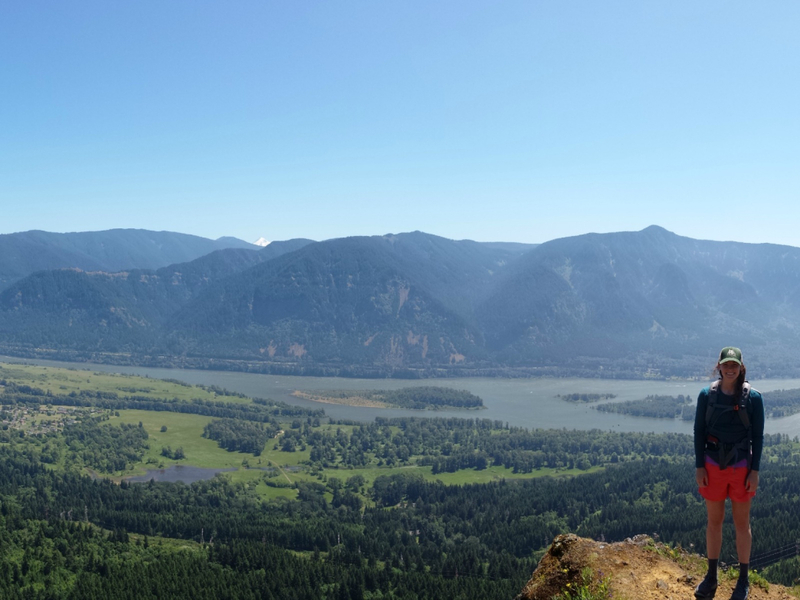 After 7 miles, you will see the parking area for Beacon Rock on your left at milepost 35 and you should take a right up the hill and the trailhead parking lot will be on your right. A Discovery Pass is required, which is a $10 day use fee or $30 annual fee. You can purchase the pass with a credit card at Beacon Rock.